Pink Day in Lion's Arch 2018! It’s that time of year again! That’s right, it’s already time for Pink Day in LA! This year, we’ll have mini-games and contests on 4 megaservers, 2 in NA and 2 in EU. Look for ads with NA - Plush Griffon, NA - Peggellegg, EU - Aurene, and EU - Dragon’s Watch. There will be prizes, radio contests, donation blitzes, trivia, and more. Events will also be livestreamed on Twitch, look for us on the front page! We’ll also have some real life prizes to give away, including items donated by former game director Colin Johanson. For a full list of the prizes, please visit us at http://pinkday.gamergivingback.com/prizes.php. At Gamers Giving Back, we believe that cancer touches everyone in some way and we don’t think it should. We want to put an end to all cancer. That’s why we’ve chosen the Canadian Cancer Society to raise funds for. All funds donated go towards their International Research Fund so that no research is limited by a lack of funds. 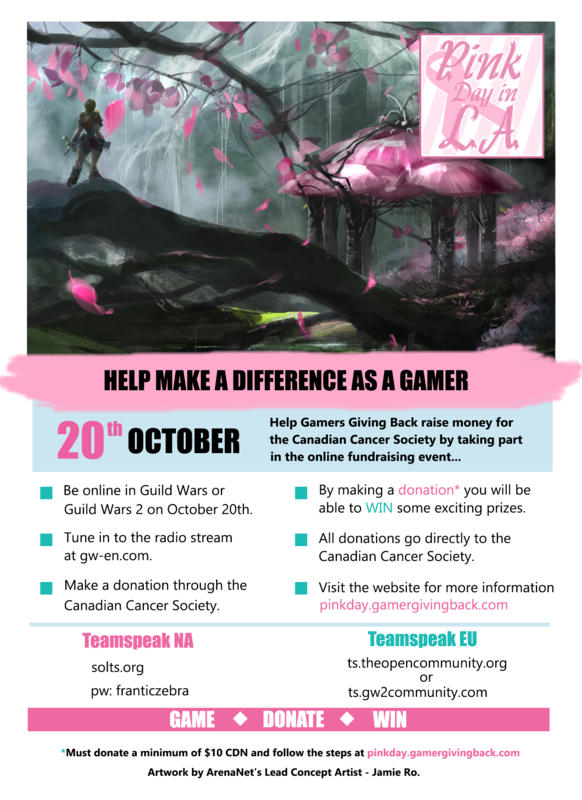 Representatives from the Canadian Cancer Society will be on air with Malibu Barbie at gw-en.com and in-game on the NA servers to answer questions. The Canadian Cancer Society is very transparent about where funds are used, and you can check them out athttp://www.cancer.ca/en/?region=on. You can also join us on TeamSpeak for event discussion, story sharing, and more! For NA, we’re using the Sol TS (solts.org PW:franticzebra) and for EU, we have 2 community TeamSpeaks: ts.theopencommunity.org (EU - Aurene) and ts.gw2community.com (EU - Dragon’s Watch). You can also get links to the donation page, radio, and livestream from the TS. We're super excited about Pink Day in LA. It's always a very fun event, and the cause is definitely worthwhile! Going to try to be there for the whole thing instead of just the start. I love doing Pink Day, and as a cancer survivor greatly appreciate the efforts being put forth to raise funds to help scientists research a cure. So excited that Pink Day is continuing this year! We have a fantastic team of volunteers on both NA and EU side this year and an amazing amount of prizes to give out to those that both participate and donate! New this year - Our Charity of Choice : Canadian Cancer Society, will have someone in-game playing alongside us! Her sentiments were: " I am pretty sure I am going to be addicted to this game and this community after Pink Day" She will be on-air with myself during the first half of Pink Day to speak about where the Research Funding is provided throughout the world and some knowledge about the varying types of Cancer, their treatments and lowing your risks. Our current time zone in Central Europe is CEST, so when converting make sure you don't put in "CET" - it is 1 hour earlier and is the time zone that becomes active after October 28th. And for our British friends, remember that GMT is not your current time zone. Your current time zone is BST, which is GMT+1, until October 28th! Today, hunting Destroyers in my Pink for awareness, Olafstead, the Far North. Original Guild Wars. There's an established event in GW1. ANET might consider coming there too. To the Gamers Giving Back community. this weekend, along with members of the Tyrian Bullet Club, I organized and ran a stroll in the PINK from the black citadel to Rata Sum. we started the walk at 10am CST and finished 4 hours later, with 2 twitch streams rolling and many participants. the whole while we were promoting Pink Day in LA and urging our walkers to donate to the cancer organization of their country (ACS, etc) . many have done so... and because it was so popular, later that night we did it 2 more times, from rata sum to the citadel and back to rata! everyone had a blast and so many are hyped to do Pink Day In LA. we raised approximately 500.00 or more that went to the american cancer society, and we hope to do more for you! OMG, I almost forgot about this. Good thing I was just randomly checking the forums today. I am on my way there now! Giving you my best wishes. Keep up the good work folks!